Four years is a very long time not to return to see friends and family, but the amazing news is that I leave in less than two weeks, and there is much excitement! Australia is most definitely my home now, but I will always have Africa beating through my veins. I’ve been so busy with kids, business, writing books and moving Vanilla Zulu that time has literally flown past. But I dream of Africa. The beat of the drums, the majestic animals roaming through seriously beautiful bushland. The sound of the birds that will take me back to my childhood. I long for the beautiful singing and dancing that will surely sound from the most unusual places. If you have never heard the tribal tones or tunes of Africa, you simply must. I remember the joy of hearing a group of wonderful women, and from who knows where the most amazing male voice, breaking into the most perfect harmonies and singing in supermarkets, service stations, coffee shops, sporting events, or even just at work. And the big big smiles and the joyous dancing. I simply can’t wait. This is a video of the Soweto Choir singing in one of the local supermarkets, and although this one is staged, I’ve seen this happen absolutely naturally too. But it’s the food, the wonderful food that I am longing for most. Like travelling to any other country, it’s like an immediate holiday. The first thing I do in a new country is head for the supermarket or local market. It simply is the best way to immerse yourself in the culture and get to know the place a bit better. The local supermarket is always a true reflection of the culinary culture of an immediate area, because that’s where the locals shop and thats what the locals are eating. Funny thing about South Africa is that the groceries are relatively expensive, but eating out is very affordable. Guess what I’ll be doing a lot of! My foodie safari begins in sunny happy Durban, on the east coast of Africa it is the cradle of African Indian cuisine. The afro-indian cuisine here is truly unique. With this culture of spice, the spice emporiums and spice shops are everywhere. The smell is insanely heavenly. The local curries are hot with curry leaf creating that wonderful mystical finish to many of the dishes. The curries are hugely tomato based, with a spice mix particular to each region and indeed each family. The huge Indian influence in Durban stems from the sugar cane trade in 1860 where indentured Indian labourers first arrived on African shores, and is now the biggest concentration outside of India. The meeting of India and Africa makes for some fiery food indeed. 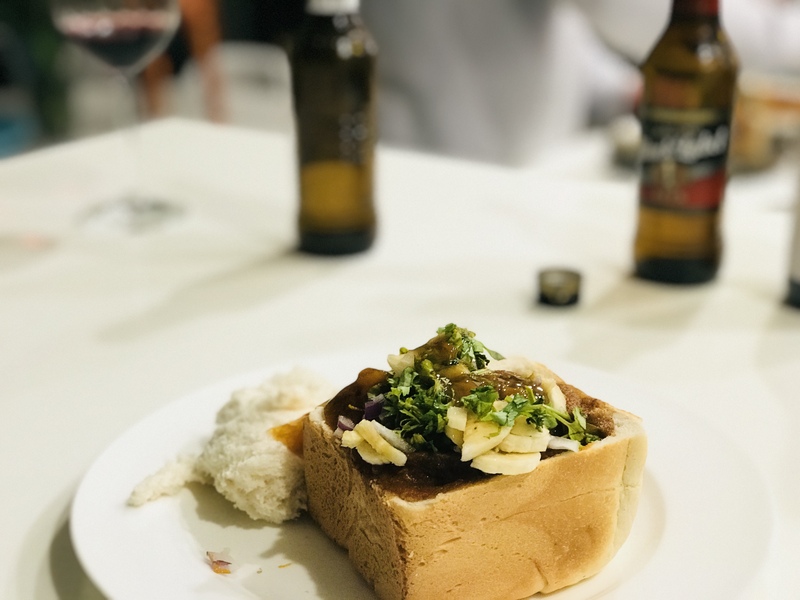 Bunny chow is a classically Durban dish. With no bunnies in sight, it is essentially a take-away dish of curry served in a quarter or half loaf of bread. This stomach-filler was inexpensive and easy to eat on the go, but although cheap and cheerful I must warn you that this is an absolute culinary sensation that I am dying to share with you. Usually served with a salad of carrot, chilli and onion commonly known as sambals, and the curry itself can be mutton, chicken or beans. Bunny is usually eaten by hand and is so delicious you’ll be licking those fingers and smiling with happiness! 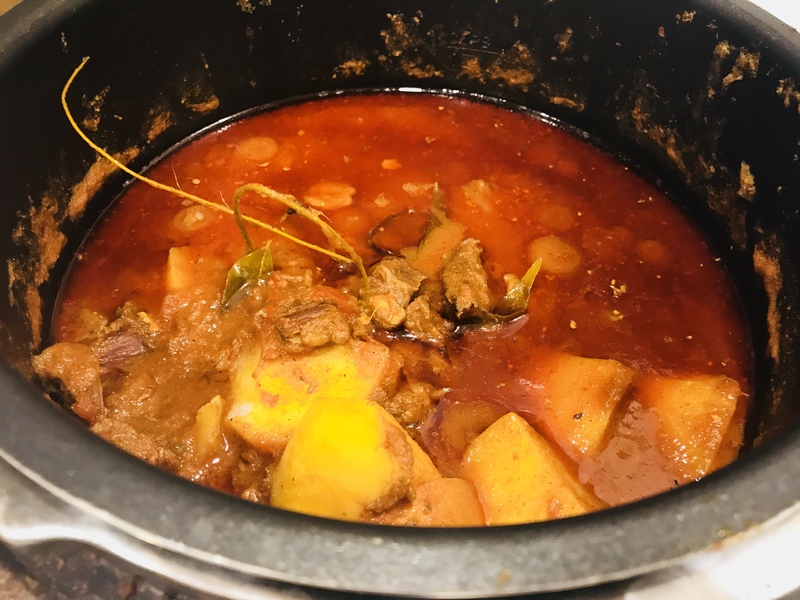 Here’s my favourite Durban Curry Recipe, we make this in the three legged pot over our open wood fire pit for a real celebration of the great outdoors! 2 small potatoes, dice of about 2cm if you want them to cook faster, bigger if there is no rush. This is really quick to make, but if you possibly can, leave this curry at the end on a very low heat for a further 20 minutes for those flavours to develop. As with any curry, even better eaten the day afterwards! Heat the oil in the pan and add the garlic, chilli and onion and stir until nicely soft, add the spices taking care not to burn them and allow them to roast off. Now add the chicken pieces and the salt and stir to coat, then let the chicken brown slightly again taking care not to burn. Once you have allowed some of the chicken to brown, add the tomatoes and potatoes and the stock and reduce the heat. Allow to cook through and stir from time to time. Once the chicken is cooked, and the tomatoes have broken down into a delicious thick sauce, and the potatoes are deliciously yellow from the spices, you can add the curry leaves. Season to taste with salt if required, you must always adjust the seasoning just before serving. 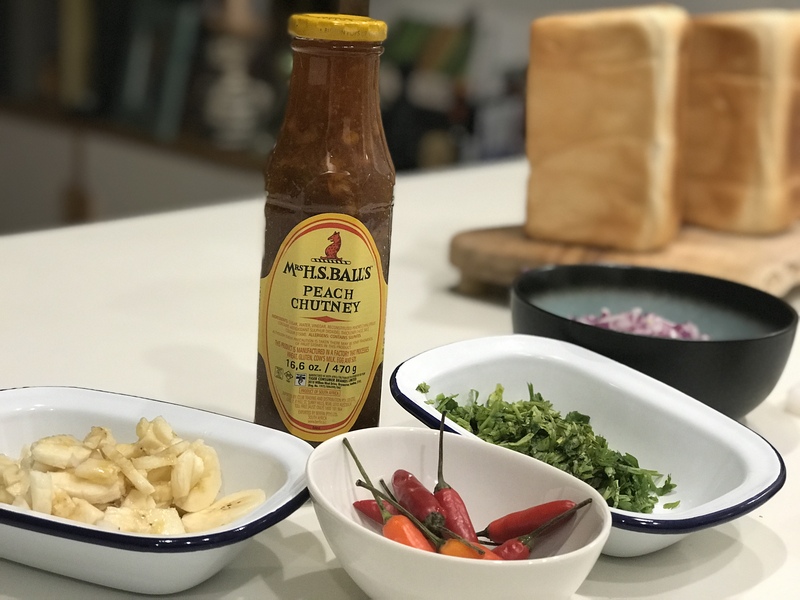 Serve in a quarter loaf or half loaf of uncut white bread and top with the sambals. Delicious and so quick! This is a Quickie in the Kitchen for sure! Happy cooking, and remember, you could serve this curry with rice if you prefer. 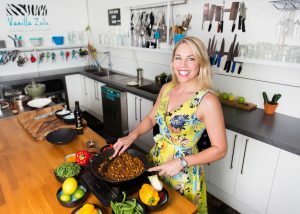 Watch this space, I’ll be sharing more African inspired recipes with you just before I go, and also as I travel! I’m your global foodie sharing my love for food so you to can escape on a foodie safari from the comfort of your own home!